I’m quite certain that my premature wrinkles are due to the fact that sometimes I worry about the little things that are unworthy and wouldn’t affect my life in the least bit and not b/c I’m a mommy to a fiery toddler who just entered the dreaded Terrible Two stage. As I get older (cringe) and somewhat wiser, I’ve learned to mentally separate the worthy vs. unworthy things to obsessed over. Because in the grande scheme of things, isn’t so much better to clear your mind of the negativity, indulge in senseless tv, and sip that cappuccino topped w/ a heaping serving of whipped cream?! Here’s to reminding you (and ME), that life’s more than about sweating the small stuff. I agree 100%! I say this line to my kids ALL THE TIME. Not sure they always listen BUT I at least follow that saying for myself and it does work. I remind myself that 99% of the things we worry about never happen. Hope you are well! So true! 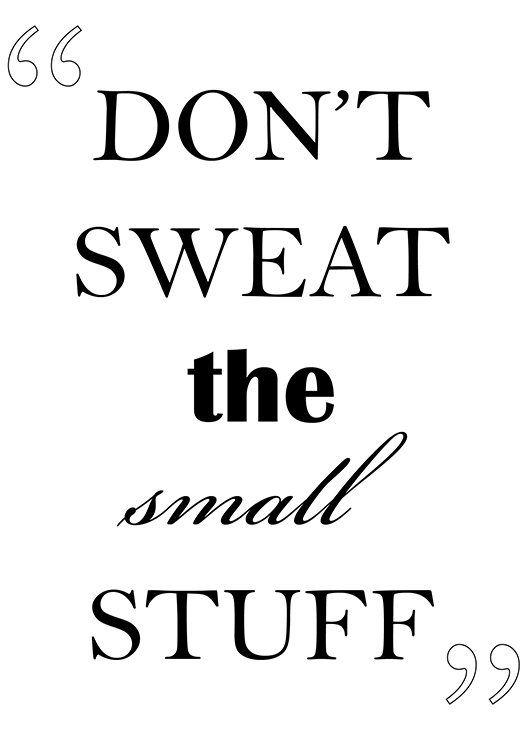 The small stuff causes the most stress. Thank you for the reminder. I do this way too often. What a great reminder! Is that where my wrinkles are coming from? Yes, I think so! Great post. Great post….needed to hear this right now too. It’s a difficult lesson to learn but an important ingredient in our quest for a happy life. Everything will be ok! Sometimes it’s hard not to sweat the small stuff so when I feel myself beginning to fret, I immediately begin listing off all of my blessings and what I’m grateful for!!! Change is the only certainty in this life of ours!! !